The University of Western States (UWS) chapter of the Student American Chiropractic Association (SACA) is slated to host the 2016 National SACA Leadership Conference on the Portland campus September 23-25. 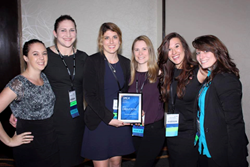 The honor comes after the UWS SACA group was named chapter of the year. “I could not be more proud of this group of determined students...,” Dr. Joseph Brimhall, president at UWS said. “They understand the advocacy and hard work that must be undertaken in order for the chiropractic profession to flourish." The University of Western States (UWS) chapter of the Student American Chiropractic Association (SACA) is slated to host the 2016 National SACA Leadership Conference on the Portland campus September 23-25. The conference is a chance for all current SACA national officers and chapter officers to come together and develop skills to be future leaders in the profession. Conference activities include presentations by prominent speakers in the chiropractic world about their individual accomplishments and how they achieved success. Other speakers will discuss dealing with roadblocks in the profession and how they were overcome. The proposed topic of integrated health care was one factor that propelled the UWS proposal to be chosen. Another factor that led to the decision to host at UWS was their success as a chapter over the past year. The group took 40 students to the National Chiropractic Leadership Conference (NCLC) in 2016, a number that is more than double what they were able to fundraise for in 2015. The UWS SACA chapter also raised the most money for the political fundraising arm of the ACA. Topping it off, they placed third in the talent show at the 2016 NCLC conference. This is the first time in many years the event will be held on a university campus after several stints at corporate-sponsored locations. University of Western States provides a science-driven curriculum that delivers a solid foundation and competitive edge in preparing students for clinical practice. UWS is a regionally accredited, independent non-profit institution dedicated to improving the health of society through its educational programs, research and clinical services. Founded in 1904, the university offers a doctor of chiropractic degree program; master’s degrees in exercise and sports science, human nutrition and functional medicine and diagnostic imaging; a massage therapy certificate program; a master of science and doctorate degree in sport and performance psychology; approved continuing education programs for licensed health care professionals; and we provide clinic services in five locations through Health Centers of UWS. UWS is a founding member of the Oregon Collaborative for Integrative Medicine, an organization that aims to advance integrative health care through education, research, patient care and advocacy. To learn more about University of Western States and its academic programs, go to uws.edu. The Student American Chiropractic Association (SACA) is a professional organization representing chiropractic students. SACA serves to preserve, protect improve and promote the chiropractic profession and the services of future doctors of chiropractic for the benefit of the patients they will serve. The mission of SACA is to build a better future for the chiropractic profession to benefit patients and the community by advancing the professional development of chiropractic students through service, leadership and advocacy.